One of the most feasible business options owing to the straightforward manufacturing process involved starting a soap and detergent manufacturing business in Bangladesh. With significant growth potential, this market is one segment of the FMCG market in Bangladesh. People use it on a daily basis for clothes, hand wash, and kitchen utensils and its demand is found in the market all through the year is a consumer good. Moreover, with moderate capital investment, an entrepreneur can initiate a detergent manufacturing business. It’s around 2.7kg per year the per capita detergent consumption in Bangladesh and its 3.7kg in Malaysia and Philippines and around 10kgs in the USA. On the other hand, the global liquid detergent market is expected to grow steadily over the next four years. So, this is a good business to start and more possibilities to be successful. 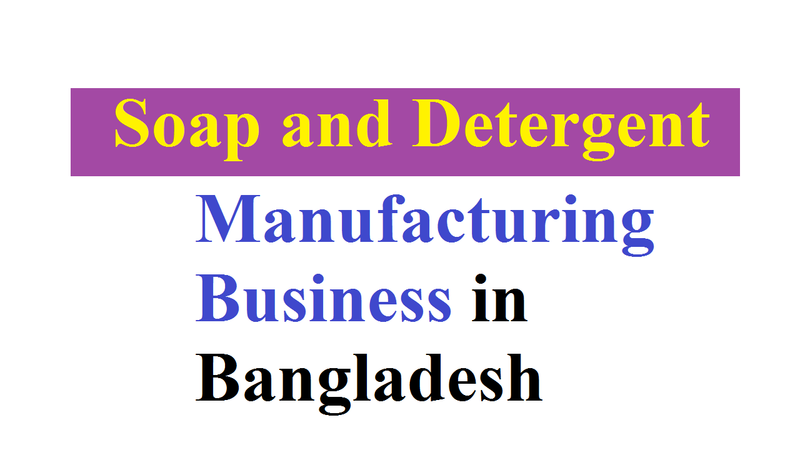 From the last five years, the Bangladeshi soap and detergent industry is growing at 13.06%. There are three categories, lower, middle and higher-end markets while catering to the segment. And it’s BDT. 500 crore detergents market is among the largest FMCG categories in Bangladesh and its next only to edible oils and biscuits. The demand for this product is flourishing due to rapid urbanization and the emergence of small pack size and sachets. Moreover, boost the purchasing capacity of the population while increasing per capita income. In addition, other reasons for the growing demand for detergent powder are including a wide range of available choice, health awareness and hunger for good living. On the other hand, the rural population has replaced detergent cake with washing powder to wash their clothes in massive quantity. It’s a promising industry in Bangladesh of producing soap and detergent. As it requires a moderate capital investment, any individual can initiate a detergent manufacturing business in Bangladesh. And we intend to explore how to start a small-scale detergent powder manufacturing business in this article. Although it looks like an easy and simple to start the business, it’s not so easy at all. Not only some simple steps but many procedures are to follow if you want success in it. Well, let’s know what the steps are to know while starting a soap and detergent manufacturing business in Bangladesh. As an essential product used daily by billions of people, soap and detergent are a fast moving consumer good (FMCG) in Bangladesh. But, before starting a detergent manufacturing business, a great deal of market research and a well-framed business plan is needed. Also, a business plan should incorporate your company’s mission statement, budgeting, and target market. If you choose a medium sized detergent powder manufacturing unit then you need a 1000m sq. ft. area, which may need a budget of about BDT 25 lakhs. Keeping in mind that the location should have adequate availability of water, electric power, and transportation, the factory location should be chosen carefully. Also, the location should choose in a region having close proximity to the source of raw materials and somewhat nearby the target market. Along with state and government zoning requirements, the factory should be in compliance. In addition, you should select the location that’s suitable for your equipment and should have ample parking facility. Apart of these, the factory should be located in an industrial zone and there should be easy access to the factory through land transportation. Looking for the most ideal and cost-effective supplier of raw materials who can ship these to you at your manufacturing facility warehouse is the next important step. It consumes about 60% of the detergent business’s working capital while purchasing raw materials. It plays an essential role in the success or failure of a business while promoting the product. As there are so many mediums through, you can advertise or promote your soap or detergent powder and can reach a maximum number of people. A huge amount of media promotions are required to establish the brand because detergent is a consumer goods business. You can think of expanding your operations to nearby areas after focus on targeting your local market. Also, you can open a detailed website of your business describing all about your organizations and product. Moreover, traditional printing and television advertisement are to be used for different marketing strategies. Apart from these, many of the marketers utilize social media to boost the popularity of their company’s laundry detergent brand.